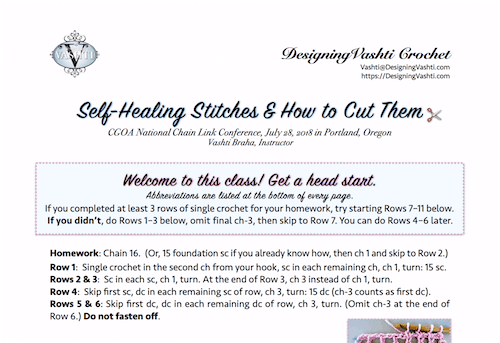 When a crochet class handout “clicks” it’s like getting a crystal-clear vision of how the class will begin and then smoothly unfold for its 3 hours. It becomes a map for the teacher too, and then I can relax. I’d forgotten about the phenomenon until it happened today with The Starwirbel Way class, so I’ll blog it here for my future self. I wonder if other teachers experience something similar. Crochet Class Handouts: Many Requirements! This year (2016) I’m adding a few initial sentences that describe how to get a head start while waiting for the class to begin. [See a 2018 example above.] People come to crochet classes with a dramatic range of skill levels; some like to explore the topic independently, and some like to arrive early. Many people also bring a range of different yarns, and need to try a few before they can settle in with one. Most people need to warm up with a row or two of a familiar stitch. Some illustrations need to be shown reversed for those who are crocheting left-handed. Starting in 2018 I print a separate sheet, usually a half-sheet, of the reversed images. I’ve added a fresh example of one on my Classes page. Ideally the handout makes a great first impression in that first five minutes of the class! Generous margins and small blocks of text help, and the font shouldn’t be too small. A crochet class handout is an extension of the teacher. It stays with every student while I’m helping someone else on the other side of the room. If someone were to ask a question that requires a demo, and two or three other people say they wonder the same thing, I love when I can answer, “Look at the photo on page 2 of your handout, and try it out while I come around to each of you individually.” So a big priority is for a handout to help me while I’m helping other students. Like some images, certain kinds of text are best in a handout. Row-by-row instructions for a practice swatch, for example. Also good is a list that summarizes and distills many details. This morning I created a sidebar of all the ways to make star stitches starrier, and bolded the ones used for Starwirbel. Sometimes a class topic is a series of specific skills that build on each other in a specific order. Checkpoints after each skill are great. They sum up what makes the step important. I love when I can also include a panel of “You Know How to Make This Now” designs! The little thumbnails are a visual reference for all the examples I show in class. What Can’t Class Handouts Do? Any hands-on activity needs some side-by-side demonstrating. This is especially the case with crochet because of how 3D-spatial it is: we’re constantly rotating hooks, turning rows, and going in rounds, while adding big lacy holes at times which add more fields of vision! Each bit of key information in a crochet class usually needs to be shown different ways. This is why people travel to take crochet classes in person. Nothing beats it, not even videos, sometimes. It’s great when a close up photo or diagram in a handout can save time or prevent confusion about a key step. Sometimes demonstrating a key stitching motion in front of the room with a gigantic hook and yarn works great; often it’s best shown up close to just a few people at a time. Over the years teachers develop a sense for which things can be nailed with a demo, diagram, swatch, or a close up of stitches done in contrasting colors. What makes a crochet class handout “click” is a bigger topic than I expected! I’ve left out so much. Creating handouts is an evolving skill. Turns out others have blogged about this too. Go check out how cartoonist Lynda Barry does it!